From engineering-to-cash, Genius ERP is a complete ERP software solution for SME custom manufacturers,including software, professional services, and field expertise. Genius ERP simplifies custom manufacturing. Genius ERP is the end-to-end manufacturing ERP software solution for planning, executing, measuring, and improving high-variable production for SMEs handling make-to-order, engineer-to-order, custom-to-order, and assemble-to-order manufacturing. Automate time-consuming steps, quote for more jobs, estimate with greater accuracy, reduce bottlenecks on the shop floor, and connect historical data to upcoming runs to streamline your production. Genius ERP is the complete software toolkit for custom manufacturers looking to take control of every aspect of their operations — all from a centralized system that's easy to use, and quick to implement. Genius ERP is built to increase manufacturing throughput. From design to delivery, Genius ERP helps custom manufacturers achieve increased throughput without hiring new staff or expanding operations. Manufacturers can handle more jobs and take on new customers while avoiding bottlenecks, stalled projects, and supply overstock. We give custom manufacturers the tools they need to reduce waste and costs, increase productivity and efficiency, and improve the performance of production sites. From production planning, CRM, and inventory management, to job costing, scheduling, and accounting, every tool you need is right at your fingertips. Complete projects like never before, take on more jobs with your existing setup, and deliver on time, every time, with Genius ERP. 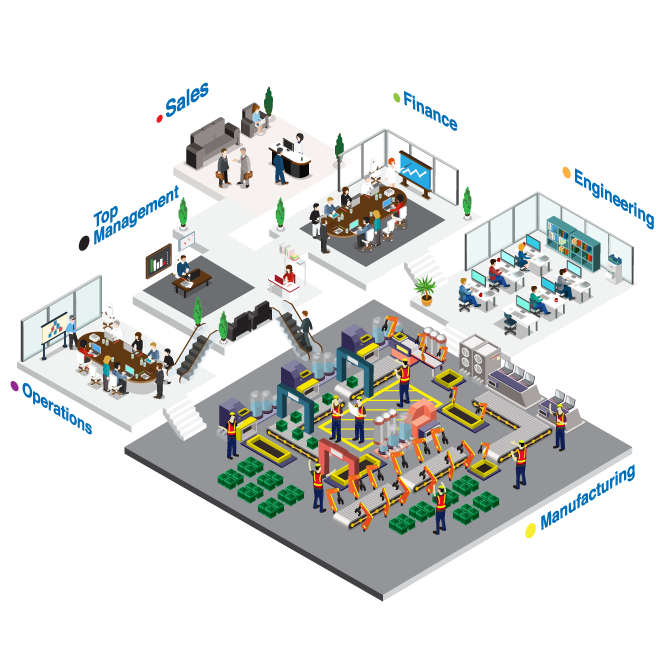 Work with industry experts, who speak the language of manufacturing. Genius ERP is more than just software — we’re a complete solution that combines software with service, support, and a deep-rooted expertise in the manufacturing industry. Our team of consultants, solution architects, accountants, project managers, training specialists, and technical analysts come from backgrounds in industrial, mechanical, and electrical engineering. We know the industry like the back of our hand and we’ll be with you every step of the way, helping you to get Genius ERP up and running at a pace that makes sense for your busy shop. Our deep industry knowledge and a hard-earned track record help us to maintain industry-leading implementation success rates. And it doesn’t stop there — we stick around to offer you best-in-class customer support to ensure your shop is always up and running at full capacity. Our experts know your business and will work hand-in-hand with you to help you grow. Genius ERP: Delivered your way. At Genius ERP we’re all about fit. Not only do we want to make sure our solution is the best fit for your shop, we also want to deliver it to you they way you want it. Whether it’s On Premise or on the Cloud, we’ll deliver Genius ERP the way that works best for you. Our team will work with you to determine the hosting solution that’s best for your budget, your shop, and your unique needs. And whether you pick a cloud ERP solution, or one hosted at your shop, you can be always be confident that Genius ERP will perform the way you need it to. Get Genius ERP the way that fits you best. One company. One solution. No resellers. No workarounds. Genius ERP maintains the quality of its services with an in-house team of manufacturing experts. Our ERP system doesn’t require costly software patches either. Everything is designed for easy service and upgrading. Companies only ever deal with members of the Genius team throughout a long-lasting partnership. Genius ERP: the complete end-to-end ERP solution to increase throughput. Save time and meet delivery targets reliably with intuitive purchasing, including for long-lead items ahead of BOM. Track opportunities, monitor sales pipeline in real-time while benefitting from all-in-one Genius ERP and CRM support. Make price inquiries for multiple items to multiple suppliers. Reorder items based on minimum stock or combine orders. Genius ERP gives you real integrations, letting you get the job done faster and easier. Our Genius Product Engineering module integrates seamlessly with SolidWorks or Inventor, and with one click produces a bill of materials, ready for procurement and production. Don’t waste time re-entering information, eliminate redundancies, and always have synchronized data on-hand. Harness the power of your corporate data and generate accurate and real-time reports, built using Microsoft Report Building Technology. Analyze data and information from across your organization to make better business decisions. With Genius ERP, we do the heavy lifting for you. To learn how Genius ERP is built for manufacturers, take a tour of an SME just like yours. From production planning, CRM, and inventory management, to job costing, scheduling, and accounting, see how Genius ERP helps you every step of the way. Genius ERP was designed exclusively for custom manufacturers — which means we’ve thought about every department in your shop and person on your payroll. Our features will make everyone’s job easier, and whether you are an engineer, production manager, accountant, or CEO, Genius ERP has the ERP solutions you need to get the job done right. Control day-to-day scheduling details with Genius Production Planning. We give you a real-time overview of your production floor, and to let you schedule better. Genius Production Planning clarifies and structures the instructions for each task, and allows you to execute tasks according to an established plan. And you can change on the fly and simplify planning by reacting to changes from your customers while jobs are in-progress. Increase throughput by prioritizing workload versus historical capacities. Have the ability to monitor in real-time timesheets and work-order completion, as well as track expenses for each job in your factory. With Genius Production Planning, organize based on actual capacity, by identifying constraints on current and proposed workloads. Genius Project Management lets you stay ahead of the game. Use the Preliminary Purchase List tool to purchase long-lead items prior to completing a BOM. Plan labor capacity utilization based on finite resources taking into consideration efficiency, calendar, and overtime. Schedule hours by competencies or department, without having to complete routing details in BOMs. Use real time visual progression captured from your plan and installation site to oversee production. Avoid interruptions with Genius Vendors, a purchasing portal that syncs with your current jobs and existing inventory. Genius Vendors allows you to make simultaneous pricing inquiries for multiple items to multiple suppliers, and receive prices from suppliers without having to re-enter any information. The recommended repurchasing function will identify potential shortages based on real-time inventory, expected delivery times, and the date required for the item according to in-process production orders. Genius Vendors also allows you to reorder items based on minimum stock or to combine purchase lists from multiple orders. Avoid production interruptions by eliminating surprise material shortages and replenish based on actual on-the-job demand or for inventory. Use mobile devices to move material, manage inventory, and eliminate duplicate data entry. Genius Inventory Management lets you track by serial number and associate different statuses to materials, so that specific materials can be counted and allocated before production begins. With good data comes reliable reports: the insights of Genius ERP are made easy to understand through a suite of reports and indicator options for SME manufacturers. Genius Business Intelligence & Analytics puts a range of reports at your fingertips, helping you to analyze information across your operations. Reach objectives by setting targets and measuring progress with each new job order. Generate accurate and real-time reports, built using Microsoft Report Building Technology (SSRS). Set up alerts to stay in control of your most important activities. Use live dashboards (late jobs, late employees, quote conversion rate, purchase order with backorders, etc. ), help guide shifting priorities. Understand true cost and optimize production by knowing actual man-hours per job. With Genius Employee Management you can use barcode, mobile or touch screen technology, to easily collect time from the factory floor and in the office. Simultaneously tally payroll and apply hours to POs for progress true-cost tracking. Attach additional expenses to jobs while in the field, as well as in your plant. Genius CAD2BOM is designed to save time, eliminate errors, prepare inventory and fine-tune quotes and estimates at the design phase. Genius CAD2BOM integrates with SolidWorks or Inventor, and with one click produces a bill of materials, ready for procurement and production. Don’t waste time re-entering information, always have synchronized data, and eliminate redundancies. For salespeople, Genius Sales CRM helps track sales opportunities, manage communications with current and prospective customers, and organize sales-related tasks. For managers, Genius CRM displays sales pipeline in real-time, tracks activity of salespeople, and analyzes data about your customers and prospects. Genius Sales CRM is seamlessly integrated with Genius ERP, providing historical information for your sales team. While quotes are done in your ERP, sales opportunities can now be tracked in your CRM. At the same time, you’ll only need one support team for both your ERP and CRM. Genius ERP's easy-to-use accounting module is in sync with all parts of your business and projects, eliminating the need to maintain parallel systems. Genius Accounting includes accounts receivable, accounts payable, general ledger, and banking management modules. The system is user-friendly, flexible, and intuitive. Our implementation team, rich in accounting experience and understanding of your business needs, can train your front office quickly. Improve throughput. Grow your business. Genius Solutions knows manufacturing, and our manufacturing experts are ready to help you grow.